Stability factor n with different crane turning angles. 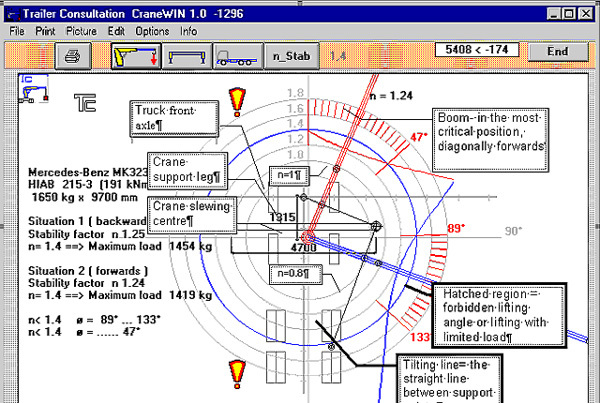 A straight line from the centre of the circle to the direction in which the crane is turned. The stability factor to that direction. The stability factors are shown in the form of different sized circles. The centre of the circles is the cranes slewing centre. The circle with the biggest radius stands for the stability factor n=1.8 and the smaller for: 1.6 , 1.4 , 1.2 , 1.0 , 0.8. The chosen critical stability factor will show at screen in different colour from the others. The figure is above the diagram at the toolbox. In the picture there are two stability factors as n-curves. One for each tilting line.